Was Rorschach's Pagliacci joke a real joke? Was this an actual joke outside of Watchmen? And if it was, was it ever told in a manner that deserved laughter and a roll on snare drums? The roots of this joke are very old, and it has been attached to a variety of clowns since its inception. That's a famous story, sometimes told as a joke, often related as fact. It's really your archetypal "sad clown" story, and indeed exactly the same tale has been told of other clowns, most notably the Swiss clown Grock (Charles Wettach, 1880-1959). "Go to see Grimaldi, and laugh yourself well." A story you may or may not have heard relates how, in the mid 1930s or thereabouts, a prematurely old-looking man asked his chauffeur to drive him to the consulting rooms of Charles Prelot, Academician, doyen of French psychologists and you name it, who'd set up his trading pad in a small palace behind the Quai d'Orsay. After half-an-hour of the usual rigmarole, it emerged that the worried patient was very rich, acutely depressed, and given to bouts with bottles of green stuff that smelt of aniseed balls. He remained somewhat vague about where his bread came from. The face of the great savant lit up. He saw both the problem and the remedy before you could say two thousand francs. "What you need," he said, "is a change. Go out and enjoy yourself. Spend a little money. Start tonight. Buy a ticket to the Olympia. Laugh with Grock for he is, you must admit, the greatest clown in France, if not the whole world. The patient shook his head. "Impossible," he said. How was that? "Because," said the man sighing deeply, "I am Grock." Once, before a famous doctor, there arrived a man of somber demeanor. "I suffer, I tell you, an evil as frightening as the pallor of my face." The doctor of course suggests that he go see the great clown Garrick: "all who see him die of laughter," and "he has an astonishing artistic gift." ¡Ah!, sí, os lo juro, él sí y nadie más que él; mas... ¿qué os inquieta? Así dijo el enfermo no me curo; ¡Yo soy Garrik!... Cambiadme la receta. And me, he will make me laugh? "Ah, yes, I swear to to you, he will, and no one other than he, but...what bothers you?" The patient said, I will not recover thus: I am Garrick! Change my prescription. Since that poem can be found here, the joke was already at least 100 years old when Alan Moore used it. There's even a version that references a nonspecific "clown" from three years before Watchmen was published. The disturbed man blurted out, "But Doctor, I am the clown!" Each of us, even the clown, is subject to periods of depression and blues. This also makes it clear that, even before Watchmen, the context was generally less humorous and more philosophic. So no snare drums. It is worth noting that the word Pagliacci translates to "clowns," and thus may stand in for a generic clown. not knowing what I say or what I do! And yet...I must...ah, force myself to do it! Bah! You are not a man! the people pay and want to laugh. laugh, Pagliaccio, and all will applaud you! Laugh, Pagliaccio, at your shattered love! Laugh at the sorrow that has rent your heart! From this, Pagliaccio (or the similar Pagliacci) has become something of a cultural stand-in for the sad clown, the performer who weeps on the inside while making others laugh. As such, his is an obvious name to associate with the Grimaldi "joke." It's been told about George Fox, "the American Grimaldi"— who sadly ended his days in an asylum, having been slowly poisoned over the years by the high levels of lead in his greasepaint. One such story was told of George L. Fox, one of the great mimes and pantomimists. It was said that he went to a doctor to try to rid himself of a persistent case of depression. After an examination which disclosed nothing organically wrong, the doctor advised his patient to go and laugh at George Fox. The patient sadly answered, "I am George Fox." The "Good Joke. Everybody laugh. Roll on snare drum. Curtains." is layered with irony, because the story here is not actually a joke, but a parable. 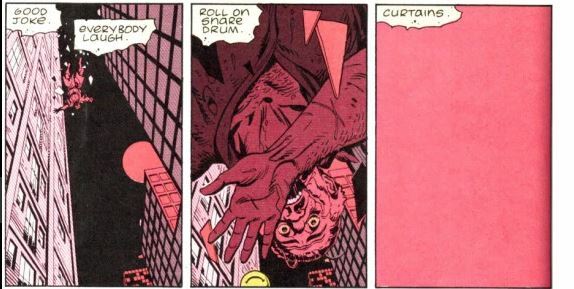 Twisting a well-known joke into a parable that tells the reader more about the character of The Comedian is just one example of why Watchmen is so incredibly well written. A lonely man sits on a bench by a river, looking wistfully out at the water. "Whats wrong with you?" says another man passing by. "I can't find love, no matter how hard I try." says the man. "Ridiculous!" scoffs the passer-by, as if by reflex. "Here, take these 2 gold coins and spend the night at the brothel down the road—that'll sort you out". "No good..." says the man on the bench. "I've been running that brothel for 14 years." Man goes to doctor. Says he's depressed. Says life seems harsh and cruel. Says he feels all alone in a threatening world where what lies ahead is vague and uncertain. Doctor says, "Treatment is simple. Great clown Pagliacci is in town tonight. Go and see him. That should pick you up." Man bursts into tears. Says, "But doctor...I am Pagliacci." This is a story of a man who sees life for what it is—harsh and cruel—which is emphasized by that action in the panels. The doctor tells him to go and see a clown, because although that provides no solution to his underlying condition, it will provide a distraction from harshness/cruelty of reality. But this idea is of no use to Pagliacci, because he cannot be distracted like the others by humour. He is the distraction. And this all ties in to The Comedian's character, which is what Rorschach is trying to tell us with this story. He fights for justice because he couldn't be distracted like everyone else. That is his reason for being a superhero. If you now read the first two panels in light of the joke, it should be a lot clearer what Rorschach is trying to say, and why this is not a mere joke. (Grief-stricken, he goes out through the curtain.)" "Good joke. Roll on snare drum. Everybody laughs. Curtains." 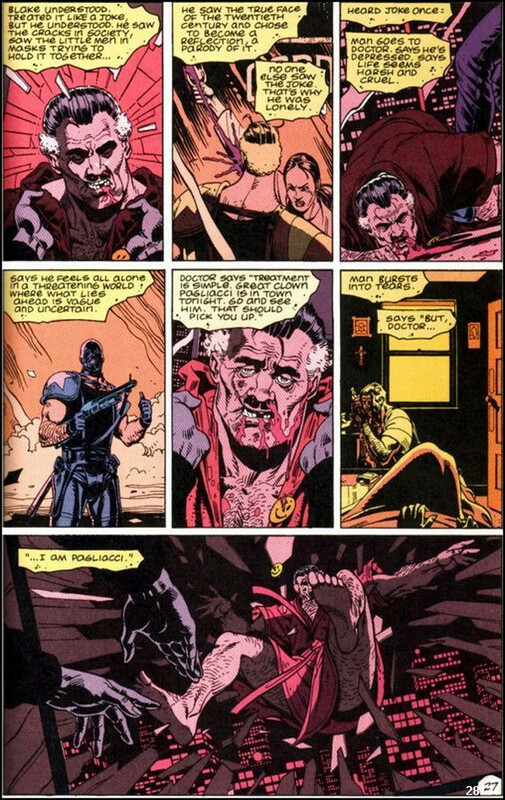 Rorschach isn't saying that the joke he just told is a good one, he's saying that Pagliacci is a joke to those around him, both on and off stage which reflects Rorschach's view of the Keene act. EVERYBODY laughs. The "punchline" that The Comedian was waiting for isn't traditionally funny... The punchline is that there is no escaping from the path he laid before himself, glad-handing and "performing" only to find it brings him empty smiles. In the same way, Rorschach is "in too deep" to sway from his extreme moralism now, so he too is forced to "put on the paint and costume" and perform his part. And as the curtain closes on the story's Auguste (The Comedian), the curtain opens for our Pagliacci (Rorschach). Not the answer you're looking for? Browse other questions tagged dc watchmen rorschach or ask your own question. Why should god bless Lili St. Cyr? Did Rorschach's mask react to his emotions? Why was Dr. Manhattan blue? What was Rorschach doing at the beginning of Watchmen? What is the fluid in Rorschach's mask? Why did news media immediately assume that the squid was an alien invasion? Why was New York attacked and not Moscow or another city? What was the Comedian's motivation for fighting crime?